Showcasing the best of movies, and film festivals from around the world. Majestic mountains, a still lake and venomous betrayals engulf a female married couple attempting to celebrate their one-year anniversary. Scanty clad female victim is pushed off the cliff and presumed dead. But she crawls to safety, brutally tending to her wounds. She then has to rely on her wits to outsmart her killer. 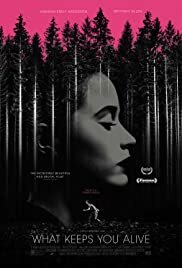 If this premise for the new Canadian thriller WHAT KEEPS YOU ALUVE seems familiar, it is also the premise of the recent French 2017 thriller by Coralie Fargeat REVENGE. REVENGE premiered at TIFF’s Midnight Madness and had a commercial run and the truth is that it is a much better film. The irony of it was that REVENGE is similar to another successful horror movie I SPIT ON YOUR GRAVE. The film begins with two women Meghan (Hannah Emily Anderson) and Julie (Britanny Allen) arriving at a cottage by a lake. (The film was shot in beautiful, Muskoka,Ontario.) It turns out that the two two women are celebrating their first wedding anniversary. Julie discovers that Meghan is not what she seems. Meghan has not only kept a secret from Julie but a sinister dark side. It is then revealed that Meghan is a psycho. The film is beautifully shot, the lake looking especially inviting. The overhead shot of the canoe with the dark lake waters is worthy of mention, thanks to the film’s cinematographer, David Schuurman. The story could have been told with a straight couple instead of a lesbian couple without much change. In fact the script was initially written with a straight couple in mind. The update is a welcome one (credit to the filmmakers for taking this route) though it might reduce the size of the film’s target market. But all good intuitions aside, the film fails because of the credibility element. The source of the terror is Meghan being a psycho. There is no explanation for the origin of her disease. With one year a a wife and wife couple, it is quite unbelievable that Julie has never suspected anything wrong with her partner. There is also too many opportunities for her to escape which she never takes. Megahn and Julie get invited to a neighbour’s dinner party. Julie has more than one chance to tell her hosts of the danger she is in but never does. She could also have run off many times but does not. The phrase WHAT KEEPS YOU ALIVE comes from Meghan’s father when a younger Meghan shoots a bear in self defence. She was forced to eat the entire bear for weeks till finished as she was taught to kill only what keeps on alive. The meaning of the phrase comes into effect again at the climax of the film. The film’s two female leads Anderson and Allen are quite good, they being together before in the horror film JIGSAW. Allen besides starring in the film, also composed the film’s musical score (which is not half bad). The film is more violent that needs be. While Fargeat’s REVENGE’s violence was entertaining, this film’s violence is just plain nasty. The film is strictly for horror fans.